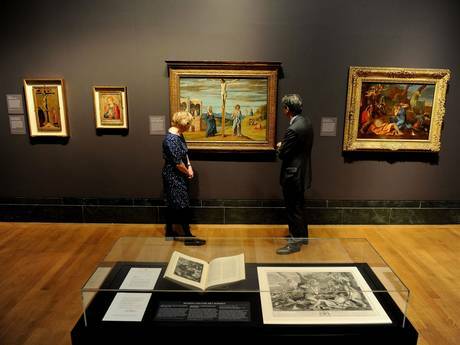 Celebrating its 80th anniversary, Birth of a Collection is part of a year-long programme of events in 2013. The exhibition reunites the first 12 paintings acquired for the Barber Institute – once on temporary loan to the National Gallery 70 years ago when the Institute was being built – by the Institute’s first director Professor Thomas Bodkin. The first painting we are introduced to is Giovanni Battista Cima da Conegliano’s Christ on the Cross with the Virgin and Saint John the Evangelist (c. 1488/93), whose works are rare in public collections outside of the National Gallery. Beside it is Saint John the Evangelist (1320) by Simone Martini, one of only four paintings by the Sienese master in UK public collections. There is Jacopo Tintoretto’s 3rd autograph portrait in UK public collections outside of London, while A Woodland Landscape (early 1660s) by the Dutch Jacob van Ruisdael hangs close by – an artist long admired by British collectors and comparable to John Constable. Claude Monet also makes an appearance with his Impressionism, exhibiting next to the Barber Institute’s first acquisition, a genre painting by Nicolas Lancret. Nicolas Poussin, Tancred and Erminia, c. 1634. Image via www.barber.org.uk. The Institute also wanted works by key figures of British art. Unsurprisingly, J.M.W. Turner features in this exhibition with The Sun Rising through Vapour (c.1809), while Richard Wilson’s The River Dee, near Eaton Hill (c. 1759) presents an example by a central figure in the development of British landscape tradition. 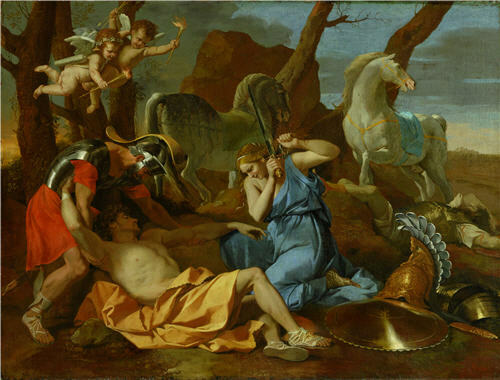 There is an interesting investigation into Nicolas Poussin’s Tancred and Erminia (c. 1634) – also exhibited – in a glass display case, where the authenticity of the work was challenged by the art historian Anthony Blunt. Presented with this is a slightly humorous letter from the dealer of the painting Sidney Sabin to Thomas Bodkin himself addressing the issue. Most surprising of all, however, was the acquisition of an unfinished portrait by Édouard Manet. The exhibition, showing in Room 1, is a lovely insight into the considerations made to establish a fine art collection. The choices are certainly diverse in their selection of artworks, presenting a decent range of paintings across different genres, styles and Western cultures. The layout is simple and effective for a one room display and it acts as a nice introduction to the history of the Barber Institute. Birth of a Collection: Masterpieces from the Barber Institute of Fine Arts runs until 1st September 2013 at the National Gallery, London, www.nationalgallery.org.uk.